It couldn’t have much sweeter. After going through a stiff competition in the 8th Grand Pacific Open held in Victoria, BC last April, 2014, Fil-Can Jose Kagaoan finally etched his name in the annals of BC Chess history when he was declared champion in the recently-concluded 2014 BC Seniors Chess Champrionship. Jose Kagaoan now joins a few Fil-Can chess masters who are champions in their own right in other categories: Vicente Lee Jr, BC Active Champion, 2009- 2010; Mayo Fuentebella, BC Active Champion, 2012- 2013 (co-champion with Maxim Doroshenko in 2011); Loren Laceste, 2011 BC co-champion and Butch Villavieja 2012 BC Champion. Actually, Kagaoan tallied the same score with runner-up Joe Soliven but wound up with a higher tie-break. 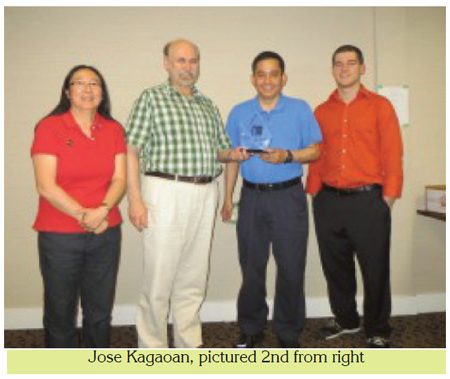 With the top seeds, namely Brian McLaren, Roger Patterson, Paul LeBlanc saddled with early draws or loss, Kagaoan was hardly challenged in the 5-round Swiss-system tournament held in Surrey, BC last June 20-22, 2014. It was in the 4th round, however, that he was tested by dark horse newcomer Enayat Ganjian. Handling White in their Bird’s Opening encounter, Kagaoan played his usual aggressive style and quickly demolished his worthy opponent’s defenses. With an inevitable threat of mate, Enayat offered his resignation. In the last round, Kagaoan missed some winning chances against Soliven who allowed Kagaoan sole control of the h-file with his rook and a threat of a passer with a pawn capture instead of a rook on the 30th move. With a pawn up but with major pieces off the board, Kagaoan couldn’t make any headway with his king and extra pawn. In the end, Kagaoan offered a draw. Both Kagaoan and Soliven scored 4.5 pts apiece. Other notable Fil-Can players in the tournament were Severo [Jun] Caluza, Manuel Escandor and Jofrel Landingin, the 2014 Keres Memorial 2000 & below category chess champion. The tournament, organized by Victoria Jung Doknjas and Paul LeBlanc, was made possible by BC Chess Federation, Comfort Inn & Suites Surrey Hotel and Victoria Chess Club led by ex-BC Chess President Roger Patterson and current Treasurer Paul LeBlanc and ably supported by Chief Arbiter Joe Roback. Individual donors included Philip Harris, Roger Patterson, Paul LeBlanc, Richard Lapenna, Doug Sly and Paul Burke.